Debian is the best, most stable, and the biggest community distro! No doubt about it. I liked its latest, Lenny very much. But all the way from downloading it and installing was not a joyride. First, I hit their download page. It was where actually my frustration began. Though the Debian download page is great with multiple options such as Minimal Bootable netinstall image, Buying Options for finished CDs/DVDs, Downloading options with Jigdo, Bittorrent and HTTP or FTP, it lacked a General Purpose installable CD or DVD Media. By "General Purpose installable CD or DVD Media" I mean the disks like Mandriva DVD, Fedora DVD, Centos DVD, using which anybody can have a smooth installation. The user can have a smooth journey of installation by choosing his/her favorite desktop environment (KDE, GNOME or XFCE) and desired platform (server or desktop). Of course, after installation he/she can choose to add/remove packages by getting connected to that particular distribution's software repository. I browsed my way to download using HTTP or FTP, chose Official Stable CD/DVD Images, clicked on i386 architecture of CD and landed on a page that's quite puzzling. There were as many as 35 CD iso images. Likewise, the Official DVD download for i386 had 5 DVD images. What to choose? And how? Even there were no information on what the individual disk images contained. Then I came to netinstall image download. It was of 150 MB in size, so it got downloaded soon. But problem began while installing as I could not connect to net. It's also not a fault/bug of Debian, but the nature of my connection. Debian installer asked to enter IP address, Netmask, Gateway and DNS servers of the network. I furnished those information, but could get connected to debian mirros. Because, My ISP requires to enter a particular username and password after furnishing those network details. So, I halted the installation then and there. Later, I took my notebook to my office where I could connect to net by just entering IP address, Netmask, Gateway and DNS servers of the network. The installation was very smooth and clean, except for some minor problems while configuring Wifi and display resolution. Those problems were fixed in half an hours of googling around. So, here my request to the Debian people is that they should bring out a general purpose DVD image (like that of Fedora DVD, Mandriva DVD, Centos DVD) or a Desktop CD image (like that of PCLinuxOS Live CD, Mepis Live CD, Mandriva One Live CD, OpenSuse LiveCD ), in addition to those 35 CD images and 5 DVD images. It will definitely bring more users to the Debian domain by clearing the confusion of so many installable media. The first CD/DVD disk contains all the files necessary to install a standard Debian system. To avoid needless downloads, please do not download other CD or DVD image files unless you know that you need packages on them. "The first CD/DVD disk contains all the files necessary to install a standard Debian system..."
Anonymous, thanks for posting the above answer. 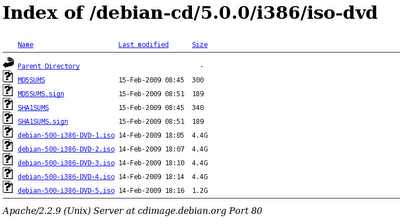 Andrewsomething, I am glad that you posted the link to Debian-live project. Why would we want more users to come that ask dumb questions like "What do I download?" when the answer is available if you do a little research before jumping in? "Why would we want more users to come that ask dumb questions like "What do I download?" when the answer is available if you do a little research before jumping in?" This tends to be the problem with the Linux community. Its never about what makes things clearer for the user. The answer is always "we're smarter than you, you dumass. We couldn't possibly make a mistake." They all act about six years old. Debian Lenny installer has installer menu, which allows you to select which desktop environment you want to install. So you can eg. tell installer to install KDE instead of gnome. It's wnoughto download just the first CD or DVD, you get working system using it. You can install rest of the stuff from the internet. Or in my opinion the most convionien option is to download small netinst-CD image, burn it to CD, boot from the CD and eg. select which desktop environment you want to install. netinst_CD will install everything directly from the internet. So you don't need to download big CD/DVD images before you can start installing Debian. mall netinst-CD is just enough.